Cementitious adhesive, suitable for the reliable adhesion of expanded (EPS) or extruded (XPS) polystyrene insulation boards, on building facades. 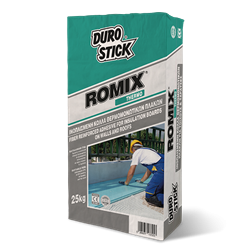 Also suitable as their top coat, in combination with the reinforced fiberglass mesh, DS-4160 of DUROSTICK. . Recommended for use with COOL ROOF and COOL ROOF LIGHT thermal insulation and waterproofing systems for roofs. Meets the requirements of ETAG 004. Classified GP: CS IV/W2 per EN 998-1. As adhesive: 2.5-4kg/m², depending on the notch size and the substrate. As coating-over-mesh layer: 1.5kg/m²/mm.